Since its inception in 1998, TAGLaw has consistently been regarded as one of the top global networks and alliances. As evidence of this, there are an estimated 170 legal networks and alliances in the world. Chambers & Partners has chosen to select only the top 10 networks and alliances to receive the “Elite” designation. 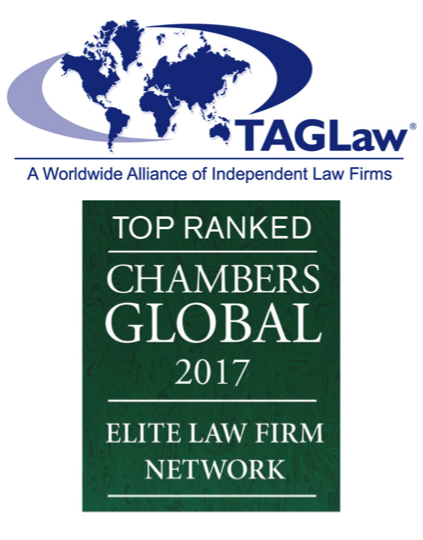 Individually, more than 100 of TAGLaw’s member firms have received awards from Chambers & Partners. In selecting networks and alliances for their “Elite” status, Chambers & Partners pays particular attention to the quality of the member firms, their global reach, and the value that the alliance provides to its member firms. TAGLaw, with a global footprint in over 90 countries has leading firms in over 160 jurisdictions providing legal services to companies ranging from the Fortune 5000 and leading SMEs to high net worth individuals. With expertise in dozens of practice areas and countless industry sectors, TAGLaw offers a potent capability to its members’ clients. This capability is expanded by TAGLaw’s unique relationship with its sister alliance of accounting firms, TIAG®, providing members and clients with the multidisciplinary expertise needed in today’s business world. TAGLaw members are invited to join TAGLaw only after undergoing a comprehensive vetting and selection process. Firms are carefully chosen based on professional competence, commitment to client service, reputation within the legal community and recommendations from existing members. Candidate firms are reviewed and if they satisfy TAGLaw’s criteria, the TAGLaw Advisory Board approves the candidate as a member. Members then receive access to TAGLaw’s international resources as well as the multidisciplinary resources found within the broader TAG Alliances™ (TAGLaw, TIAG® and TAG-SP™).